16oz Claw Hammer with Hickory Handle. High quality, drop forged fully polished head with a hic..
20oz Claw Hammer with Hickory Handle. 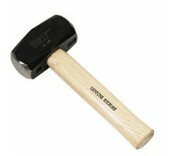 High quality, drop forged fully polished steel head with..
2.5lb Lump Hammer with a Wooden Handle. Drop forged steel head with a fully polished stri..
4lb Lump Hammer with Hardwood Handle. Drop forged steel head with a fully polished striki..
24oz Brick Hammer with Hickory Handle. Drop forged steel head with a wooden hickoty handle. T..
1.5lb Hand axes are ideal for trimming stray branches and splitting firewood. The heads are for.. Solid rubber mallet with wood shaft. 24oz ..
7lb Sledge Hammer with Hickory Handle. Drop forged carbon steel head with precision milled fac..
10lb Sledge Hammer with Hickory Handle. Drop forged carbon steel head with precision milled fa..
14lb Sledge Hammer with Hickory Handle. Drop forged carbon steel head with precision milled fa.. Replacement sledge hammer handle 36" Length Fits 7lb, 10lb and 14lb Heads ..
20oz Claw Hammer with Tubular Steel Handle. High quality, drop forged fully polished steel hea..
16oz Claw Hammer With a drop forged, hardened and tempered fully polished steel head. So.. Solid drop-forged steel brick hammer with impact absorbent non-slip rubber handle This brick ha..
20oz Claw Hammer With a drop forged, hardened and tempered fully polished steel head. Soft gr..
2.5lb Lump Hammer High quality, drop forged polished steel head Strong fibreglass shaft and c..
4lb Lump Hammer Drop forged steel head, polished striking face. Strong fibreglas..
7lb Sledge Hammer with Fibreglass Handle. Drop forged carbon steel head, precision milled face..
7lb Sledge Hammer with Fibreglass Handle. Drop forged carbon steel head, precision milled faces..